Dr. Ken pops up in the most popular places! In this article from Milwaukee Magazine, “The New Men’s Club”, regarding the growing popularity of cosmetic procedures for men, Dr. Dembny was consulted for his thoughts on Botox. A National web ratings service has listed Dr. Dembny as one of its award winners. Celebration Media U.S. Announces Customer Care News Magazine Celebration Media U.S., parent company of the Talk of the Town Awards, is pleased to announce publication of the Fall 2011 issue of Customer Care News, a magazine designed to explore the relationship among customer care, customer satisfaction and the bottom line. For five years in a row, Dr. Dembny ahs been recognized as one of Milwaukee’s very best cosmetic and plastic surgeons – by those that mean the most – his patients. The Patients’ Choice recognition reflects the difference a physician has made in the lives of his or her patients. The honor is bestowed to physicians who have received near perfect rating scores as voted by the patients. Congratulations, Dr Dembny. 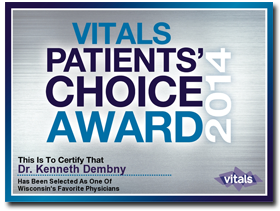 Once again, for the third year in a row, Dr. Dembny has been recognized as one of Milwaukee’s best cosmetic and plastic surgeons. The Most Compassionate Doctor award is based upon the good ratings and praises he has received from his patients regarding the kindness and compassion of the care he delivered. Of the nation’s 870,000 active physicians, only a very small percentage received this honor. Dr. Ken continues to pick up Patient Awards!